With the kids out of school, it’s officially summer time. And what’s summer without a good old family road trip? Take some time to read our road trip safety tips to help make your vacation hassle-free and enjoyable for everyone. We don’t want any mishaps along the highway, so make sure to get your car looked over for any underlying problems that could arise during your vacay. Stock up on emergency supplies like a spare tire, first aid kit, jumper cables, flashlights. Give your ride a wash and make sure it is sparkling clean before you leave. This will ensure that all your windows have a clear view. And of course, fill ‘er up with gas. Try to plan out your stops on each leg of your trip. The last thing you want is to stop at a questionable rest stop at night in the middle of nowhere. Don’t get stuck with a gas station hot dog; also knowing where the best places to eat make stopping more exciting. Roadside attractions can also be fun and educational so try to pick a navigator that will find the best ones to visit along the way. Many cars these days have DVD players, and tablets are sure to keep kids entertained for a while too. 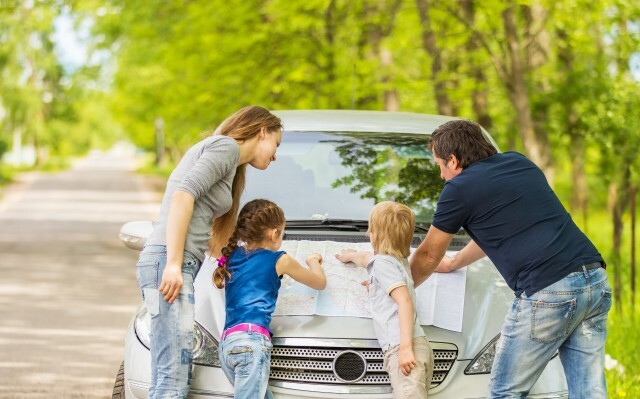 But if you want the kids paying attention to the journey, bring back some of your favorite road trip games like: the license plate game, road trip bingo or I Spy. Here’s an article with some more game ideas. If you have complainers, implement a reward system. Whoever has good behavior gets a special treat at the next stop. Hopefully they’ll catch on so they can get a candy bar. Did you know that using your cellphone while driving in California is illegal? Something we do all the time in Florida could be an automatic ticket in another state. Make sure you do a bit of research for the states you plan on visiting. The Governors Highway Safety Association has highway safety laws broken up by state.